I saw the Magnifilm version of "The Bat Whispers" at the Museum of Modern Art in the '80s. 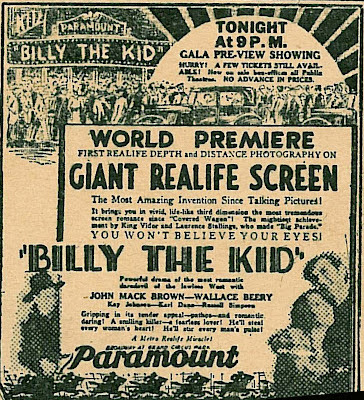 I actually had a little trouble trying to wrap my brain around the idea of a widescreen movie from 1930. Hi Mr. Pat --- Thanks for that link to errors in the "Widescreen Movies" book. 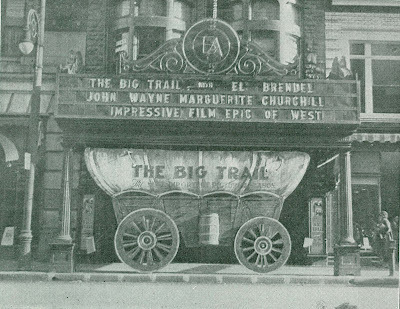 I read their chapter on early wide films, but did not rely on any of it as it was obvious a lot of their facts were questionable. 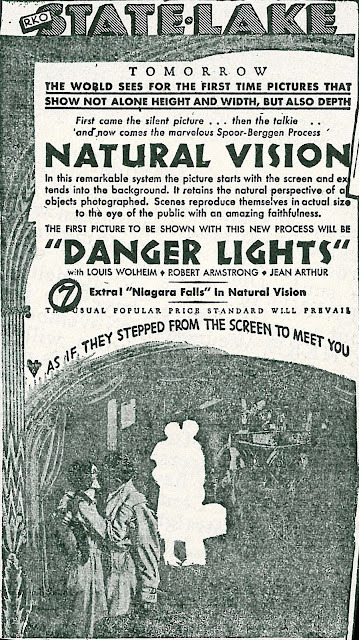 I did confirm that the "Niagara Falls" short ran first as part of the Grandeur showing of "Fox Movietone Follies" at that Sept. 17, 1929 showing. 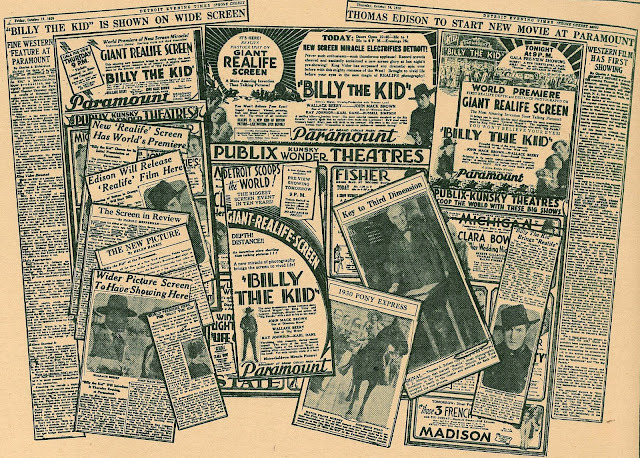 As to "Billy The Kid" surviving in large format, I addressed the subject in Part Two and the info came from a reliable source at Warners. Wouldn't it be great to see that wide! Again, that is fascinating info you sent, and much appreciated. 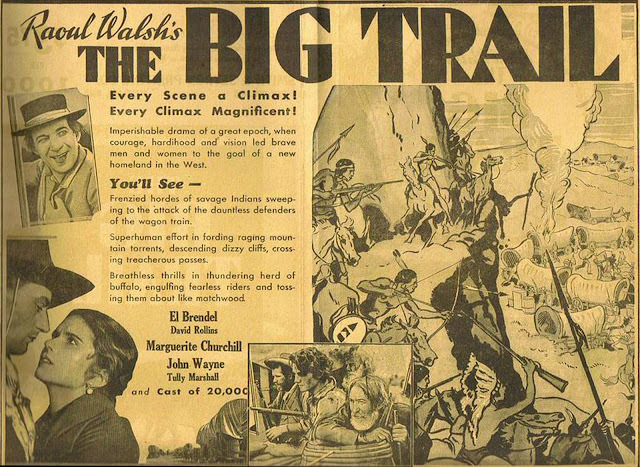 I hadn't heard of "The Big Trial" -- or pre-Cinemarama widescreen -- until I stumbled over a bit of "The Big Trail" on TCM one night years ago. I'm sure I cocked my head like a mystified dog..."widescreen -- but picture & sound quality definitely early thirties???" 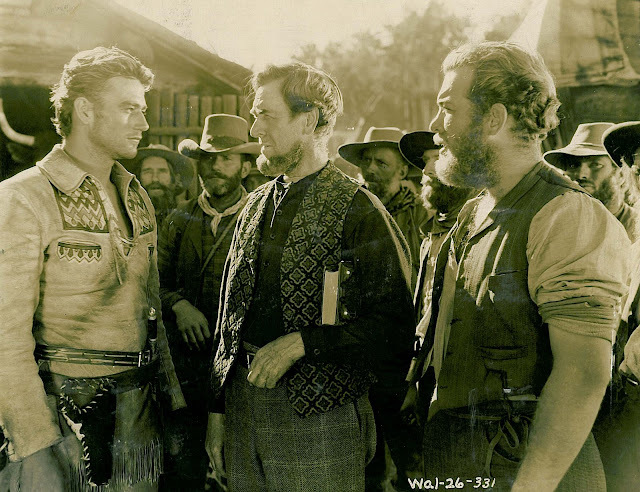 "young John Wayne????" Like East Side said, hard to wrap you head around. Hey, John: While I fully realize that this is really more about the technical/exhibition-end of the picture, I think some mention, in passing, should also be made of Ty Power,Sr. I believe this is the only sound-record we have of that great, legendary "barnstormer" of the 20's, who supported John Barrymore in "Hamlet" and of course, was the father of the son. As I recall, he plays a grizzled, gravel-voiced "sourdough"-type, but considering that he must have had considerable "theatrical" influence on Ty,Jr. 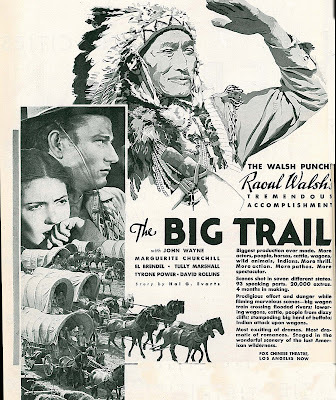 (who was light-years away in type -- at least one can draw a pretty-fair line of continuity between Lon Chaneys, Sr.& Jr., and of course, Liza Minn- elli & her mom), still it does add considerable "historical" interest to a film which already has considerable "historical interest". 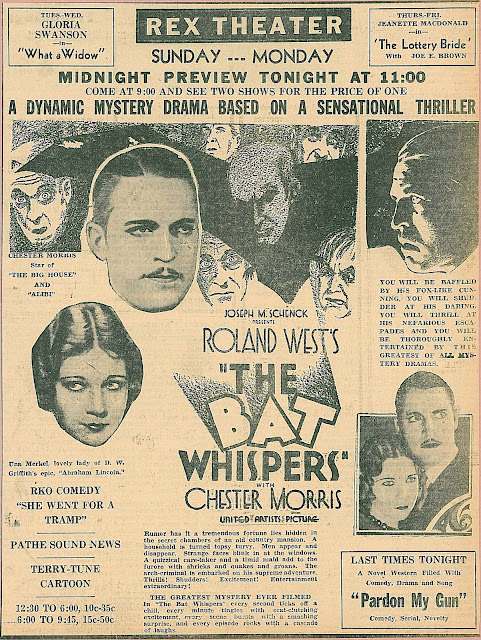 I'm glad you mentioned "The Bat Whispers", which I find far more watchable on a whole lot of levels. 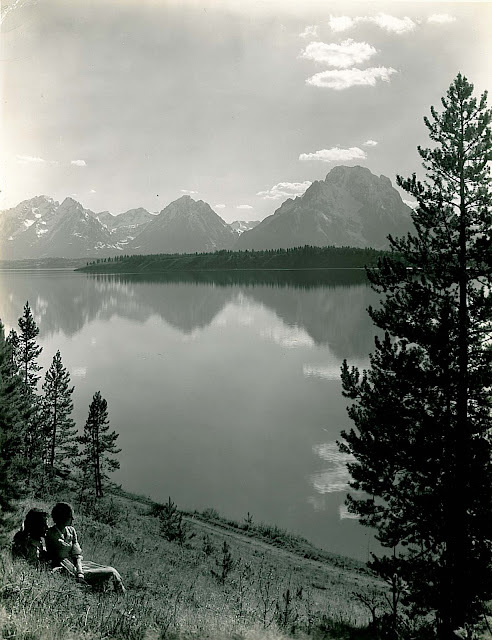 Some of the visuals West acheived early in the film are truly breathtaking! P.S. : I hope you realize that I meant to say "defer", instead of "differ", in my recent-note on the other posting. However, until I was actually in the middle of writing that, I had honestly forgotten that story about Spencer Tracy's brother Carroll (They really did look that much alike, and Spencer had really passed, only like mere days before that incident. I swear to god, for a minute there we all really thought we had stepped into "The Twilight Zone"! Best as always. R.J.
A study of El Brendel's popularity -- and he must have been popular, or Fox wouldn't have kept giving him such prominent roles -- is long overdue. He's somewhat appealing in "Delicious," especially during his rendition of "Blah, Blah, Blah," but that's about it. Perhaps there is some earlier film in which he was funny, and audiences went to his subsequent films hoping to see that El Brendel. (It's not hard to think of other comedians who've kept the customers coming to their turkeys because they did some genuinely funny work early on.) Or maybe he's just the 1930 counterpart to 50's comedians like George Gobel -- someone whose humor escapes anyone who wasn't there at the time.